Just in time for Super Bowl, Facebook is upping its game with a new online hub called The Facebook Sports Stadium where sports fans can enjoy real-time engagement and follow sporting events as the action unfolds. Facebook has long been a fan favorite for celebrating and debating sporting events, but the network has lacked the real-time element that’s helped Twitter score big with users. 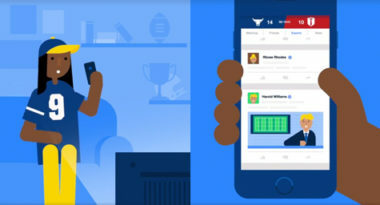 Now, The Facebook Sports Stadium will let sports fans discuss these details live on Facebook with fellow fans, friends, sports experts, journalists, and even players. This new feature should help Facebook stay competitive over the second-screen experience with popular live public forums like Twitter and Snapchat. TheWallStreetJournal.com featured more on how Facebook is going live to stay on top of the competition and ahead of the game with sports fans. Following live sporting events as the action unfolds. Engaging in real-time conversations with fans, friends, and other sports enthusiasts. Reading the latest posts and comments from sport experts, journalists, and team members. Accessing live scores, stats, and play-by-play of games. Getting complete information on game times and viewing stations. Today, live events on TV have been an extremely effective way to drive online engagement. And Facebook knows that more engagement leads to more advertisers looking for more exposure to engaged users. But up until now, Twitter has held the title of the network for real-time engagement on all sorts of sports. More recently, Snapchat has entered the game with its Live Stories feature for many major sporting events. Yet with the kickoff of The Facebook Sports Stadium right before the Super Bowl, Facebook is vying to take the lead in real-time sports conversations, beginning with the biggest game of the year. With the arrival of The Facebook Sports Stadium, Facebook is striving to enhance the experience offered by its feeds to let sports fans engage live about the sports they love. Learn about the latest evolution of Facebook. Contact MDG Advertising.